Fedora 16 is shipped with the Region and Language configuration tool, which allows you to configure keyboard layouts, the language of your desktop environment, and other regional settings. To start the tool, open the System Settings window by selecting Applications → System Tools → System Settings from the Activities menu, and click Region and Language. 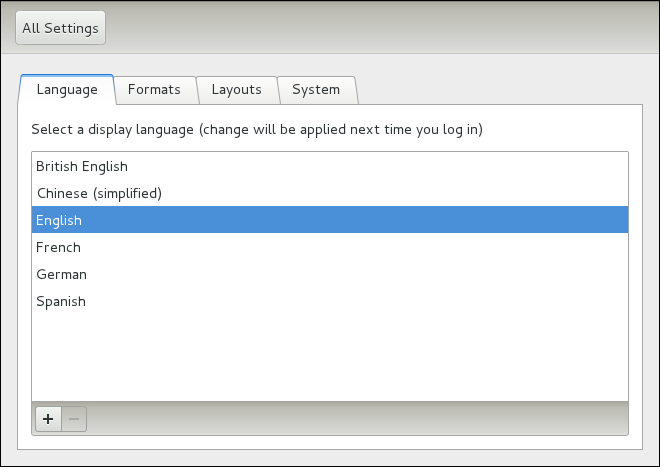 To configure the language of your desktop, select the Language tab of the Region and Language application. You will be presented with a short list of common languages. By default, this list only contains a few of the available languages. To add another language, click the + (the plus sign) button below the list. A dialog window appears, allowing you to select the desired language. The input field at the bottom part of the dialog window allows you to reduce the number of displayed items by first few letters part of the language name in it (for example, “slov” for the Slovak language). Once you select a language, click the Select button to confirm your choice. To choose a particular language from the list, click its name to select it. The changes will take effect the next time you log in to the system.